located in Custom House Plaza Monterey State Historic Park. Friday-Saturday 11am-10pm and Sunday noon-8pm, Custom House Plaza, Monterey. $12 for adults, $10 for children 12 and under and $3 skate rental fee. Take a break from all of that shopping and let out some steam at the ice rink at the Northridge Shopping Mall in Salinas. Open during normal mall business hours, 796 Northridge Mall, Salinas. $15 for adults, $12 for children. Have a holly jolly shopping experience at the Del Monte Center this weekend. On Friday evening shoppers can enjoy music from Sonshine Brass. Saturday will feature a balloon twister and music from Cypressaires and the Bornia Boys Blues Band. Sunday will round out the weekend with carols from the Merry Carolers and an appearance from Mama Claus and Eddie the elf. Friday- Sunday, 1410 Del Monte Center, Monterey. Free admission. Christmas just wouldn’t feel right without catching a performance of the Nutcracker. The Dance Kids of Monterey perform Tchaikovsky’s masterpiece all weekend long at the Sunset Center in Carmel-by-the-Sea. This is the one time of year to catch the Nutcracker Prince, the Sugar Plum Fairy and dancing toy soldiers. Friday and Saturday at 7pm and Sunday at 2pm, San Carlos & 9th Avenue, Carmel-by-the-Sea. $30 for adults and $24 for children ages 12 and under. Why wait for all of your favorite holiday movies to air on TV when you can watch a live performance of several of them in Carmel-by-the-Sea! Every Christmas Story Ever Told retells classic Christmas stories like How the Grinch Stole Christmas, A Wonderful Life and Frosty the Snowman. Friday and Saturday and 7:30pm and Sunday at 2pm, Circle Theatre, Casanova Street, Carmel-by-the-Sea. $7-$35. Wind down from the work week with a relaxing evening with Terrence Farrell at the C Restaurant + Bar at the InterContinental. His guitar and the views of the ocean are sure to mellow you out. Friday and Saturday from 5:30pm-9pm, 750 Cannery Row, Monterey. Free admission. The Mucky Duck on Alvarado Street presents blues guitarist Jake Nielsen and his band “Triple Threat”. Jake will also be accompanied by drummer Derrick Martin; you do not want to miss his drum solo! 8pm, 479 Alvarado Street, Monterey. Free admission. An artist’s reception will be held for the First Night ArtWorks! exhibit in the Alvarado Gallery at the Monterey Conference Center. The night will be packed with refreshments, live music from Heartstrings Monterey and a chance to meet and greet the talented young artists. 5pm-7pm, 1 Portola Plaza, Monterey. Free admission. Bernardus Lodge in Carmel Valley celebrates the return of the truffle. The 15th annual Truffle Dinner will begin with a cocktail reception featuring Cuvee Champagne and Sobieksi-Black Truffle Martinis. Cocktails will be followed by a magnificent six-course tasting menu prepared by Chef Cal Stamenov. 6pm, 415 W. Carmel Valley Road, Carmel Valley. Call 831-658-3400 for more information and reservations. Stop by Jose’s Underground Lounge for live alternative rock music from Beretta and Raw. 8pm, 638 Wave Street, Monterey. One of Monterey’s favorite cover bands, A Band of Ninjas, performs at Bullwacker’s tonight. Pull up a chair by one of their outdoor fire pits and enjoy the show! 8:30pm, 653 Cannery Row, Monterey. No cover. Rex Wheeler performs acoustic rock music tonight at London Bridge Pub. 9pm, 256 Figueroa St., Wharf #2, Monterey. No cover. Get your jingle bell on at the Jingle Bell Run in Pacific Grove this morning. Santa’s helpers will embark on a 5K run/walk along Pacific Grove’s coastline to raise money for the Arthritis Foundation. So dress up, tie jingle bells to your shoes and enjoy the views! 8am, Lovers Point Park, Pacific Grove. Registration is $25 in advance and $35 the day of the event. Guides from the Monterey Peninsula Regional Parks District set out on a Fabulous Ferns and Redwoods Hike this morning. Hikers will take the Garzas Creek and Terrace Trails and venture into Redwood Canyon. The 3.5 mile hike is expected to last 2-3 hours. Don’t forget to bring water, snacks and good hiking shoes. 9:30am, East Garzas Trailhead, Carmel. It’s a bird… it’s a plane… it’s Santa Claus! That’s right, boys and girls, Mr. and Mrs. Claus have taken their helicopter out for a ride from the North Pole to Carmel Valley. After a safe landing the pair will travel by land in their sleigh to the Carmel Valley Youth Center for photos and holiday cheer! 10am, Carmel Valley Airfield, Carmel Valley. Free admission. For some seasonal decorating ideas head on over to Earthbound Farms. The pros will teach amateurs how to twist grapevines into beautiful wreaths and Chef Sarah will show you to bake the perfect gingerbread cookie. 11am-2pm, 7250 Carmel Valley Road, Carmel Valley. Free admission. Join the Monterey County Agricultural and Rural Life Museum for their Holiday Open House. Festivities will include crafts, entertainment, wine tasting, shopping and more! 12pm-4pm, San Lorenzo Park, King City. Admission is free with a donation of two canned food items. Interested in the seals you see around Monterey Bay? Attend a lecture at the Pacific Grove Museum of Natural History about elephant seals. Dr. Daniel Coast from the University California of Santa Cruz will also talk about other Monterey Bay natives like blue whales, humpback whales and California sea lions. 3pm, 165 Forest Avenue, Pacific Grove. $5. One of Monterey’s most unique holiday events is tonight! Christmas in the Adobes occurs in twenty historic adobes decorated in holiday splendor from the 19th century. Refreshments and live music liven the night. Docents and volunteers will also be available tell the story of each of these charming buildings, many of which are only open to the public during this celebration. 5pm-9pm, downtown Monterey. Tickets are $20 for adults and $2 for children ages 6—17 (must be accompanied by a paying adult), and free for children ages 5 and under. Buy tickets now at the Cooper Museum Store. Contact the Custom House Museum at 831-649-7120 for additional information. Take the kids out tonight for Christmas at Wild Things. The event will include a holiday themed animal show, holiday lights in the animal neighborhood, refreshments and a visit from Santa. 6:30pm, 400 River Road, Salinas. $20 for adults and $14 for children 14 and under. London Bridge Pub presents John Michael tonight. Don’t miss John’s great vocals; he is even a trained opera singer! 9:30pm, 256 Figueroa St., Wharf #2, Monterey. No cover. The Monterey Museum of Art La Mirada spreads their Christmas cheer with Old-fashioned Storytelling for the Holidays. Listen to several Christmas themed stories from authors including Twain, Capote, Shaw, Longfellow and more! 1:30pm, 720 Via Mirada, Monterey. Free admission. Holman Ranch’s new tasting room hosts a cooking demo featuring suggestions for food and wine pairings just in time for holiday meal preparations. Chef Tony Baker from Montrio Bistro will teach you how to prepare small holiday bites and will specify what wines to serve with each dish. 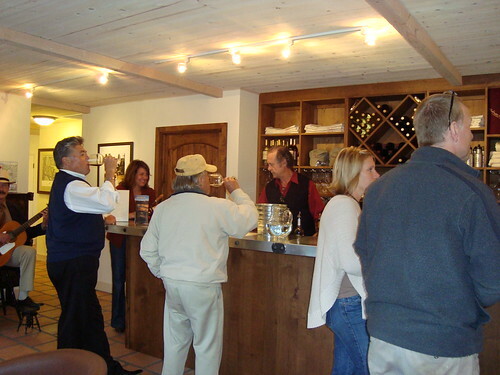 2pm-3pm, 19 E. Carmel Valley Road, Suite C., Carmel Valley. $25. Call for reservations 831-659-2640. Hang out at the Mucky Duck this Sunday with reggae artist Tony Miles. You will have a jammin’ time as he performs out on the patio all afternoon. 4pm-8pm, 479 Alvarado Street, Monterey. Free admission. MY Museum is calling all kids to enroll in Elves-in-Training. Tiny tots will build crafts, play games, enjoy holiday snacks and even receive an “Official Certified Elf” certificate. 6pm, 425 Washington Street, Monterey. $25 for nonmembers and $20 for members.